A 45 minute low impact, cardiovascular workout on the Keiser M5 Strider. This will include varied intervals of sprints and hill climbs, followed by active recovery. During class participants will utilize three different hand positions as well as focus on different muscle groups. This class will be limited to the first ten people in attendance. Pick up your class ticket at the front desk to reserve your spot. Striders will be given out on a first come, first serve basis. New Equipment and FUN, New Class! Maggie has been instructing group fitness at MAC since 2010. 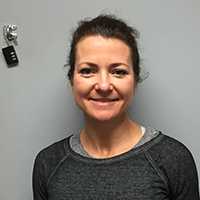 She is certified to teach group fitness, Spinning, Body Pump, and BOSU. At MAC she teaches Power Pump, Boot Camp, Power Fit, and Spinning. Besides her children and their busy schedules, she would say fitness is her hobby! You can always find Maggie on a piece of cardio equipment or working out on the fitness floor with friends. 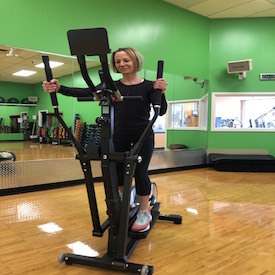 Maggie is known at MAC for her great music and the variety of exercises she brings into her classes for she enjoys learning and trying new fitness ideas to push not only the members, but herself as well.